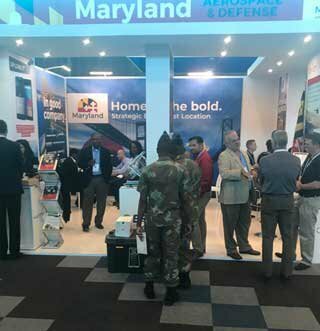 The Maryland Department of Commerce is leading a delegation of six companies this week to Africa Aerospace & Defense 2018 in Tshwane, South Africa, the largest exhibition of its kind on the African continent. This is the second time Maryland has led a delegation to this biennial tradeshow, which attracts attendees from over 100 countries around the world. In addition to the five companies exhibiting at Africa Aerospace and Defense, nine other small and mid-sized Maryland companies have been awarded ExportMD grants to help promote their products and services in the global marketplace.